What is a Negative Buyer Persona, and Why Do you Need One? Without knowing who you’re targeting, it’s impossible to effectively craft messaging, capture attention, and push the right leads down the funnel to ultimately gain more business. Each and every digital marketer knows the importance of having well-documented buyer personas. However, what about the people you don’t want as a customer? What about the customers that seem like they fit perfectly into your buyer persona at first glance, but turn out to be less than ideal? As the digital marketplace becomes increasingly more cluttered, time and energy is a more valuable resource than ever, and marketers need to ensure both are used as effectively as possible. As a result, it's vital to ensure that marketing and sales are focusing on the highest quality, most profitable leads. To avoid spending time on poor quality leads, the answer is not to update your buyer personas. In fact, what you should be doing is adding a new resource to your arsenal: The Negative Buyer Persona. While it’s still important to understand who you’re targeting, it’s becoming equally as important to know who you want to avoid. Creating the negative buyer persona will help you do that. 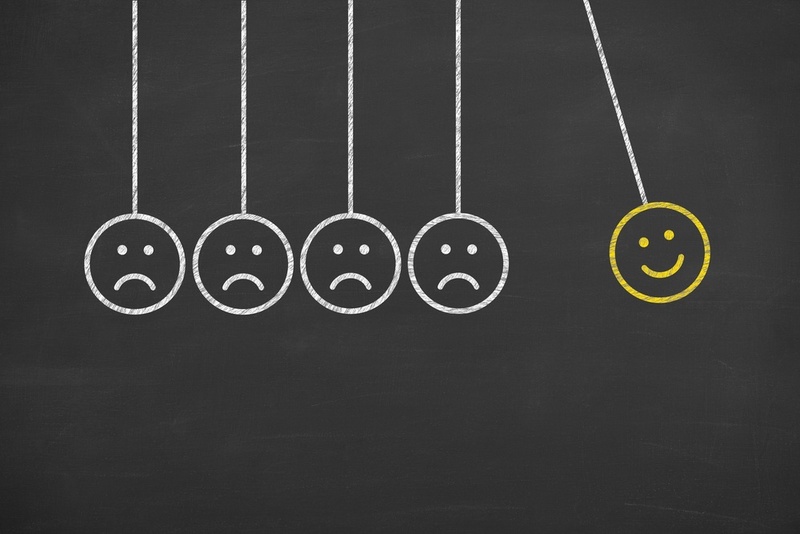 What’s a Negative Buyer Persona? Just as buyer personas help you better personify your ideal buyer, a negative buyer persona (also known as an exclusionary persona) helps you better understand and identify anyone that’s not a good fit for your product or service. A negative buyer persona would represent “a collection [of] behaviors, demographics, and real life scenarios that disqualify [leads] from your pool of happy, paying customers” (Source). While every client relationship is different, the accounts that proved to be problematic for your team will often contain several similarities. This may lead you to conclude that they weren’t a great fit for your company for one reason or another. It doesn’t mean these companies or clients are inherently “bad,” just not a good fit for your company either by goals, culture, or other reasons. Why are Negative Buyer Personas Important to your Marketing Strategy? Like buyer personas, negative buyer personas help give marketers a better idea of what to target (or in this case, shy away from) in our messaging, outreach, and strategy. By compiling the traits of the customers you don’t want, both marketing and sales can quickly identify customers that might not be a good fit for your organization. Creating this negative buyer persona allows you to better spot “red flags” early on, and focus efforts on better quality leads outlined in the original buyer persona document. Furthermore, a well built negative buyer persona can help marketers fine-tune their messaging and strategy even further, so the leads that are pulled in are much more likely to be high-quality leads. This means sales won’t have to weed out bad leads nearly as often. The first step to creating a negative buyer persona: finish your company's main buyer persona’s first! It may seem obvious, but you can’t accurately depict who you don’t want if you don’t have a clear idea of who you do! After that, the process is relatively the same as creating the original buyer personas, just looking for different qualities. As explained above, consider who you don’t want. What are they like? What are their pain points or biggest challenge? How aggressive are their goals? And how difficult or expensive were these clients (if based on real-life experiences) to acquire or manage? 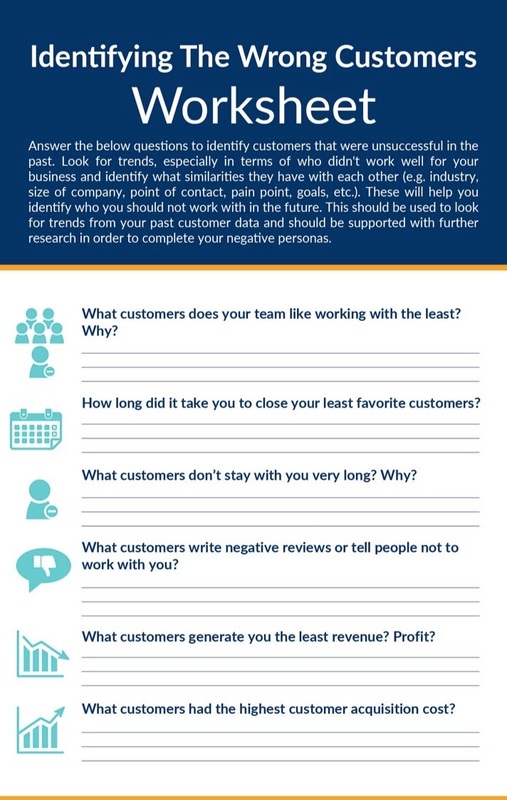 If you need some extra help to jump-start this process, Kissmetrics put together the worksheet below to help companies better narrow down these tricky personas. Once you have all of this data, you simply put together these personas in the same fashion you would for your original buyer personas. Make them just as realistic and detailed as your buyer personas, but be sure to emphasize the qualities that caused them not to be a good fit above all else so these leads can be easily identified. As with your main personas, be sure to update these periodically to reflect the changing marketplace and your organization's unique needs. What once might have been a bad fit could be a great working relationship, so you have to be sure your persona documents reflect these changes. While creating negative buyer personas may take some time, having them on-hand adds so much value for both sales and marketing. Knowing your negative persona’s provides marketers with the insight they need to better create their content so they’re attracting the right leads. This allows us to know your target audience even better, and understand their unique challenges & goals and how your product or service can give them the answer they’re looking for.